Woodlands Stop Over & Lodge: Self Catering Accommodation and Camping in Francistown, Botswana is situated on the site of the “Hunters’ Road” and overlooking the Tati River, 10km North of Francistown on the Nata/Maun/Kasane A3 route just 7 hours from Pretoria, 5 hours from Maun and 5 hours from Kasane. An ideal place to stay to break the long journey for those exploring the Northern territories of Botswana or returning home and for those wanting to be safely off the roads before dark. Grassed individual campsites with their own braai, water and electrical points are provided. Or sleep soundly in cozy tiled chalets with African cane furniture and 3/4 size beds, each with its own electrical supply and a tea/coffee facility. Perhaps you would prefer to relax in the luxurious Woodlands Cottage or one of the eight Riverview rooms. All units are fully equipped for self-catering. Parking is adjacent to each room. Also available for your convenience are pre-cooked/frozen meals, braai packs, wood, ice, refreshments as well as other basic food commodities. Breakfast packs for the early traveller are available. A large variety of Botswana bird species can be viewed. Experience the call, in the summer months, of the migrant Woodlands Kingfisher who nest here annually and after which the stop over is named. Animals which are frequently sighted or heard are Kudu, Impala, Bush buck, Duiker, Steenbok, Jackal and monkeys. 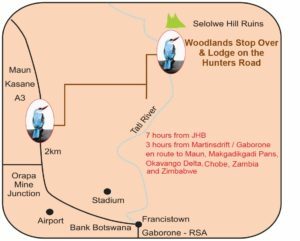 Lovely walks along the river bed/bank and within easy walking distance are the Selolwe Ruins ….. a National Monument site. Visit the Old Hunters’ Road wall situated at the entrance to Woodlands Stop Over & Lodge.